Searching for information on The Royal Sussex Regiment? As the title implies, this is a history of Lowther’s Lambs, the 1st, 2nd and 3rd Southdown Battalions, or officially the 11th, 12th, & 13th Battalions, The Royal Sussex Regiment, from their formation, starting in September 1914, through training, arrival in France in March 1916, to their first major action, The Battle of the Boar’s Head, in which they were decimated, the 13th being “all but wiped out”. The book is the result of twelve years research (still ongoing), and was fifteen months in the writing. It is well illustrated throughout with period pictures, maps, line drawings, casualty lists etc, including eight colour pages, whilst the appendices contain many documents, both instructions and reports, directly relating to the events of 30th June, 1916. Priced at £9.99 and £16.99 respectively, plus postage and package at cost. This book is only available from The Royal Sussex Living History Group for the time being, until we can resolve the issues of account information with others such as Amazon. Trimen, R. (Southampton Times Newspaper and Printing and Publishing Co. Ltd., 1873). Skinner, F. St. D. (The Royal Sussex Regimental Press, Anibala, India, 1906 Out of print. Courtenay, E. J. (Harrods Ltd., 1915). Out of print. (Printed by Gale & Polden., 1927). Out of print. Martineau, G. D. (The Royal Sussex Regimental Association, 1955). Out of Print. 16 pages including photographs – available from the Regimental Museum, Eastbourne. Fazan, E. A. C. (The Royal Sussex Regimental Association, 1971). Out of print. Format: 2003 N&M Press reprint (original pub 1934). Gillings, Murray. (The Pinwe Club). The story of a wartime Battalion, raised by Lt. Col. (later Field Marshal) Gerald Templer in the aftermath of Dunkirk. The Battalion was disbanded in March 1946. Powell-Edwards, H. L (Andrew Melrose Ltd., 1921). Out of print. The story of 1st R Sussex which arrived in S Africa April 1900. The author served in the battalion, was killed at Abraham’s Kraal 28 January 1902. Records of The Royal Sussex Regiment – A Catalogue. These volumes not only list every member of the Regiment who received awards, ranging from Commendations through to Victoria Crosses; but by incorporating Citations, extracts from War Diaries, newspaper reports and personal memoirs, they provide an operational record of the Regiment during these years. Photographs of many of the recipients are included. A labour of love, congratulations to Richard on producing both these superb books, and our thanks to him for generously allowing us unrestricted use of the contents of both volumes. WHEN THE WAR IS OVER – The war memories of William Holmes. A member of the Royal Sussex Regiment, William was given the order ‘every man for himself’ following the attempt to stop the German Panzers at Cassell, 20 miles from Dunkirk. He made his way to the beach to find that, along with thousands of others, he had ‘missed the boat’ and was eventually rounded up by German motorcycle troops. Over 40,000 BEF men were taken prisoner in and around Dunkirk and herded into reception centres known as Front Stalags. Soon they began a long trek into captivity. William ended up at Stalag 8B near Lamsdorf in Upper Silesia and spent four years at Mankendorf, a two day journey from Lamsdorf, working in the village sawmill. A5, vi + 82pp, inc 7 photographs and 1 map. £9.95 including UK postage. Add £2.00 Europe, £6.00 outside Europe. The gripping and harrowing personal account of a young Eastbourne Corporation gardener’s forced march through eastern Europe as a POW while his Nazi captors fled the Russian advance during the harsh winter of 1945. Douglas Swift, of the Royal Sussex Regiment, was captured near Amiens in 1940. He and his scandalously ill-equipped comrades had bravely tried to withstand General Guderian’s Panzers as they made their lightning advance through retreating French troops. Shipped off to Poland with the few remaining survivors of his unit, Douglas Swift endured the hardships and brutalities of several Stalags, before the notorious Death March. A remarkable first-hand account of endurance. 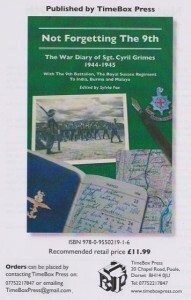 Contrary to military orders Sgt Cyril Grimes kept diaries during 1944 and 1945 when he served in India, Burma and Malaya with the 9th Battalion, Royal Sussex Rgt. He kept their existence a secret. But, falling ill after engagement with the enemy in the Arakan, he shared his lengthy convalescence with Sgt.Jim Harris who realised what he was doing. The men became close, but after the war lost contact for many years. Jim told his daughter about the diaries, and after both men had died, she discovered that Cyril’s family had kept them safe so had them published. These rare accounts provide an insight into the trials of soldiering with “The Forgotten Army”. Well written, the reader can follow descriptions of training, long train journeys through India, the effects of combat, and life in the infantry in a difficult climate. Many photos, maps and a Roll of Honour add to the pleasure of the book, which will be enjoyed by readership beyond that of the military enthusiast.